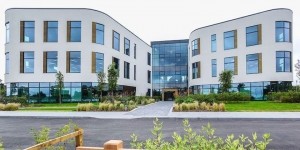 A few years ago, UCML were appointed to manage the utilities for a new 91,000sq ft head office. The office boasts a tree house meeting room, nature trails, and even a pub. The scheme welcomed Royal Highness the Prince of Wales to officially open the new offices. UCML coordinated the diversion of an existing overhead electricity cable for the scheme and also managed a high voltage point of connection.During the project construction, UCML liaised with the local authority regarding the nearby new link road to ensure utility installation did not disrupt the road development. UCML ensured that the installation of utilities complied with the timeframe of both the office and the link road as not to cause disruption and delays. An interesting ‘fun fact’ about the project is that an ‘otter bridge’ was constructed at the site for a nearby habitat!